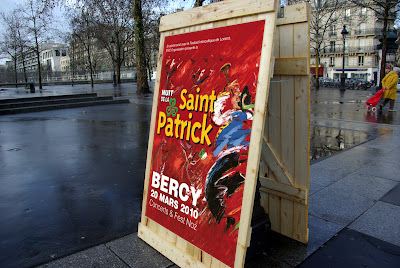 ParisDailyPhoto: Proud to be a celt! We don't have many Irish people in Paris (about 15 000 according to a few sources that I found on the web), but we have Bretons! Bretons (remember this post?) are the people who live in the northwest west of France and who originate from the same Celts "tribes" and share more or less the same language (even though, it's not much spoken anymore, at least in France). This year, to celebrate Saint Patrick, they organized a huge Celt gathering where Irish, Bretons, and Asturians (Celts from Northern Spain) will gather, dance and play the bagpipes (check this if you want to hear what it sounds like- go directly to minute 4:30!). If you want to join them, it's next Saturday in Bercy. Some years ago I took classes in Celtic culture and learned about the Bretons ("The Horse of Pride") and the Spanish celts. I would love to attend this festival. Looks like its rainy in Paris now. My grandmother was a Bretonne from Quimper and she always said the Celts shared the same humor and the same enemy. LOL!! Can you guess who that might be?? We have a real Breton style creperie in San Francisco called "Ti Couz" owned by a true Bretonne where they make the authentic buckwheat crepes. You should try it the next time you are in San Francisco!! What a wonderful capture of tones and contrasts. I am sure the festival will be fun. Hey, I know a little about this! The Bretons came/went over to France from Cornwall, and their languages overlap by about 75%. For comparison, Cornish and Welsh only overlap about 60%. et pédalez furieusement en-dessous !" Something like "Always take exemple from ducks : show others a quiet and indifferent attitude and pedal furiously below". Hmm! Let's see now what St Patrick's Day festivities will come up to. No doubt that'll be a big stuff. The festival sounds like fun! Wonderful colors, perspective and framing!! Bonjour et buongiorno, Eleonora. Your "Roma Every Day" blog is fabulous, too, from photos of Piazza del Popolo to flickering street lamps in the evening. Eric, I think Eleonora's blog is Rome's competition with Paris Daily Photo! I think the "merci" comment yesterday was somebody being sarcastic, and offended that you didn't mention St. Patrick's Day on the 17th. You made up for it today. Yes Eleonora's blog is fine! Roma and Paris are close btw. as an Irish in Paris (one of the 15,000) I have to let you know that while we embrace our Breton cousins, our languages are nothing alike. Celtic languages split into 2 grouping many years ago Brythonic and Goidelic. While the Bertons share a similar root with the Welsh and the Cornish, we Irish share ours with the Scots and the Manx. Scots Gaelic and Irish Gaelic are very very similar. Berton shares very very few words with Irish. just wanted to leave a note. Do you already know that one: http://www.paris-26-gigapixels.com/index-en.html ? You even wet the street for dramatic effect? This new format is really pushing you to a whole new level! Thanks, Eric, for introducing me to the word 'Asturans'. How ON EARTH could I never have heard of that before?! My roots are celtic (born in Scotland) after all, but well, as I console myself, you can't know everything! Hopefully Bercy will be great, but it'll never match a proud Scottish marching band..! Interesting blog hope in future i spend some remember full time on this website. Looks Like Smoke. Produces vapor resembling smoke which after exhalation leaves a pleasant aroma that is quickly odorless upon dispersal. I like to comment on the blogs which have a great information, like this. Great post. Very informative.i think I'll spend much more time on this website. Even though I am not celtic myself I would not miss a chance of a good night of drinks and dance. Keep posting the dates. Thank you so much for posting this great article, I am so interested on what I read, good and useful content. my hobby is old photo collection.this site best for me.I'm happy to read great post thanks for sharing. I wanted to thank you for this great read!! I definitely enjoying every little bit of it I have you bookmarked to check out new stuff you post! The Bretons are an ethnic group located in the region of Brittany in France. Hmm. Great post.. I read your post thoroughly and got many more about do’s and don’ts.. Its really perfect for my business and i hope i will improved it with no time... Thanks for sharing..
Not bad dear.I am impressed with your writing style and i guess so many are impressed that's why they are commenting on your post. Before reading your post i don't know another option for ad sense. thanks for sharing. Have a excellent day!. I like to check out your blog a couple times a week for new entries. I was wondering if you have any other topics you write about? This article is full of fantastic and educational stuff. Very impressive to read. Thanks! Really interesting information, I loved it! Excellent post. It was very helpful for me.I knew little in this part before,Thank you for sharing! Wow man,I love your article and your website.The picture is also really nice,so thank you so much for your effort. A fantastic useful website. Retain submitting posts just like. The use a fantastic familiarity with the niche. Thank you regarding revealing this kind of write-up in which schooling of men and women concerns one of the most. An individual means of articulating posts by means of terms is very useful. this individual means of articulating items is most beneficial and also useful. Retain revealing posts similar to this. A fantastic write-up together with greatest outcomes. I will be fantastic lover of one's website. Each and every time my partner and i appear the following my partner and i notice one thing extremely fresh. Thank you regarding revealing the data. Thank you for writing such a wonderful piece of information. Keep sharing such ideas in the future as well. This was actually what I was looking for, and I am glad to came here! Thanks for sharing. This is very interesting site. I really enjoyed to be reading it. Keep posting and sharing like this!! Good to see some detailed information on this topic. Thanks for the share. I really appreciate it. Small fingers make plastic beads in a large size the perfect option for bracelet making. These plastic beads are smooth making them good to wear on the wrist and come in a wide range of colors. Cut your plastic chain about ten inches. Sure they won't need that much, but it will make it easier for you to finish it off. When it is long enough to wrap around their wrist finish the piece off by adding a plastic connector and then running the wire back through the connector. Both young boys and girls enjoy making beaded jewelry and plastic button. You can have fun with this as a project for a group or even as a plastic charm for your own children or child. While a plastic key chain that connects a small item to a keyring is very convenient for your daily life. Wow great i have read many articles about this topic and every time.Great post. deck repair laguna beach I guess I will have to continue studying yours and pray that someday I will write on a subject with as a lot wisdom as you have! Bravo!! They must have plenty of participant in this site, i think they will contact all the people to see their opinion bout the new topic. Great post I must say. Simple but yet entertaining and engaging... Keep up the good work! This is very interesting site.I really enjoyed reading it.Keep posting and sharing like this!! makeup videos I want to thnkx for the time you have put in composing this blog post. I am hoping the same top-grade blog post from you in the upcoming as well. In fact your creative writing skill has inspired me to start my own blog now. Really the blogging is spreading its wings quickly. Your write up is a fine example of it. skin care products Its consistently great to learn guidelines such as you part targeted blog posting. As I only began posting remarks targeted blog and dealing with trouble as in lots of rejections. I think the suggestion would be useful for me. i'll let you know if its function for me too. Glo minerals | glo minerals makeup | glo minerals foundation | glominerals reviews | glo minerals pressed base | glominerals foundation | buy glominerals | glominerals where to buy | glo minerals retailers I think it is a really nice point of view. I usually meet people who rather say what they suppose others want to hear. Good and well written! I will come back to your site for sure! Thank you very much. Such information is rare in the internet. Very useful post. I have been searching about a week. In fact, greater than what we had acknowledged ahead of the time we stumbled on your excellent blog. My partner and i no longer nurture doubts plus a troubled mind because you truly attended to all of our needs here. A family orientated event that celebrates Scottish, Welsh & Irish heritage through showcasing cultural education, entertainment, music, food, sports, arts, historical exhibits & family clan representation involving local and surrounding communities. very nice info about all the stuff here.. nice pic! Its always good to get some hints like you share for blog posting. Thank you for your high quality work and keep on writing articles in such a high quality manner. Hi I attempted to sign up to your RSS and the link seems to be broken. How can i get around this? Regards! Thank you for your post, I look for such article along time, today I find it finally. this post give me lots of advise it is very useful for me . thanks for the pic, love stopping by this blog. I would prefer not to kid myself into thinking that I will come across an article such as this for quite some time to come. It really made me rethink some views that I honestly thought could not be changed. Such was the persuasiveness of the words used here - the conviction of which leaving an indelible impression ... and other such similar things as this! Thanks for sharing,, good job! At final a internet site I concur with. It feels like Ive read some useless things recently, so its nice to study some thing good. Link as well as Develop one of the most suitable Smokeless cigarette manufacturers. Parade and get all the most up-to-date along with Surmount Graded Smokeless cigarettes that you can get. My brother suggested I might like this blog. He was totally right. This post actually made my day. You cannt imagine just how much time I had spent for this info! Thanks! I needed to thanks pretty a lot with this illuminating article. Ive right now bookmarked your blog, when Ive more free time I am going to have to perform some further learn. Thank you for your wonderful article. Incredibly informative and I enjoyed reading it along with your other articles. Many thanks for sharing and continue the good work. Great post and very interesting information! Wish you the best of luck and looking forward to checking your blog more often. Great to become browsing your blog once more, it continues to be months for me. Properly this write-up that ive been waited for so lengthy. I will need this write-up to total my assignment inside the college, and it has exact same subject together with your article. Thanks, great share. Whats with metabolism? Could someone describe to me what is the offer using a sluggish metabolism and quicker metabolic process? Ive heard that when a single exercises, metabolism gets to be faster, although I will not know what this does. Does one particular burn up calories quicker? Ive also heard that when a single stops physical exercise the metabolism slows down. Any concepts? Thanks in advance. Youre so cool! I dont suppose Ive learn something like this before. So good to search out someone with some unique ideas on this subject. realy thanks for starting this up. this web site is one thing thats needed on the net, someone with a bit originality. helpful job for bringing something new to the internet!